Hiding between news of countless minor updates to iOS, you may have missed the announcement about FaceTime supporting group video chat. The party hotline, of sorts, is said to support up to 32 people, and it’ll drop with iOS 12 later this fall. If one face is good, Apple obviously believed that 32 are better. But after seeing the demo, I’m not convinced this is a feature ready for primetime. 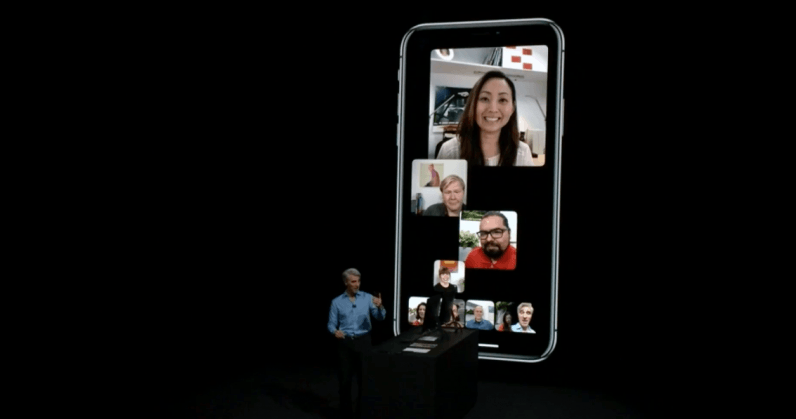 First, a group chat with 32 people will be unlike anything we saw today at WWDC, where Apple VP Craig Federighi made a fashionably late entrance to an already-running call with several other people. With five people, it looked awful. Wrapped around far too much unused space were floating images of the people taking part in the call. As each spoke, the floating heads warped to allow the person currently flapping their gums to occupy the bulk of the allotted screen real estate. The animation was odd, as were the floating heads. I pity anyone on shrooms during the keynote. As terrifying as the feature was with four or five moving blobs, I can only imagine the horrors that await anyone that tries to cram 32 people into the same space. Or, perhaps it’s better if we imagine talking to animated unicorns and koalas during our next quarterly report. Granted, most of those on the call will occupy the bottom row, where you’ll scroll back and forth, presumably, to see who has the mental fortitude to stay on such an unruly mess of a call. I’d imagine the top part will be limited to four or five video images, although even that looks like a horrific waste of space. It’s like the really bad collage you’re forced to hang on your refrigerator because your toddler isn’t old enough to understand that her dreams of becoming an artist are about as likely as me playing starring in the next Sharknado movie. Plus, there’s the issue of etiquette. The use case here isn’t defined by a scripted call on stage at a developer conference; real people are going to use this. When’s the last time you hopped on a call with more than three people and saw each patiently await their turn to speak? What happens when these people aren’t so polite in a real world use case? I’m already a bit nauseous just thinking about the constant movement involved when resizing the screens of 32 users in near realtime. Look, I’m not going to pretend I know the answer to how Apple should shove 32 faces on to a screen at once — or if it’s even necessary. But starting with a grid, like Houseparty, probably wouldn’t be the worst idea. Maybe we can go with that approach and skip the trippy club visualizations on the finished product, Apple?